The percentage of Colorado children whose families live in poverty nearly doubled over the last decade from 10 to 18 percent, marking the steepest increase in the country except for Nevada, according to the 2013 KIDS COUNT report. That meant that an additional 6,000 children sunk into poverty between 2010 and 2011, on top of 113,000 children already subjected to poverty since 2000. We are not where we should be. We are not even close to where we want to be, Gov. John Hickenlooper said Monday when the Colorado Childrens Campaign unveiled the new data at the Capitol. The governor said hes hopeful the poverty rate increases appear to be slowing. And, as the economy improves, he also hopes fewer parents will be jobless and that their children will then fare better. The rate of increases has gone down significantly. Thats always important to make sure the trend is not accelerating, Hickenlooper said. (Poverty) is still growing. That has been a function of in-migration: kids coming in (to Colorado) whose parents werent earning enough. Chris Watney, president and CEO of the Colorado Childrens Campaign, noted that the poverty data come from 2011, when economic woes were still severe in Colorado. We arent sure yet where this is headed, Watney said. We had a really hard time recovering from the recession. The many costs of poverty can be devastating for children especially with respect to health and education. For instance, child obesity rates are significantly higher in Colorado than adult rates and they are much higher among the poor. We are the only country on earth where obesity is connected to poverty. This is a unique issue that we face, Hickenlooper said. The lifestyle conditions that have created this epidemic of obesity around the country start at very early ages. Theres no better place to address this than with 3- and 4-year-olds coming into daycare and high quality early childhood education programs, he said. Gov. 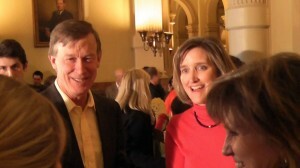 John Hickenlooper with Nancy Almond, director of the Estes Valley Investment in Childhood Success program. Hickenlooper said Colorado must grow healthy children before the state will ever meet his goal of being the healthiest state in the nation. Hickenlooper cited numerous programs that the Colorado Health Foundation is leading to aggressively make sure every kids gets a healthy breakfast. Along with healthier foods, the governor is hoping that better access to health care will help kids succeed. Indeed, the percentage of children who now have health insurance has increased dramatically over the last decade. In 2010, the most recent year for which data are available, 9 percent of all Colorado children under age 18 were uninsured, the lowest percentage since 1992. Between 2009 and 2010, the number of uninsured Colorado children dropped from 117,000 to 113,000 according to U.S. Census data. Hickenlooper is banking on Colorados health exchange slated to open on Oct. 1 to help more families get health insurance. We lead the nation in one sense in developing the state-based insurance exchange which, if used properly, should help expand the number of kids that are covered, Hickenlooper said. The number of children in the state has consistently increased since 1990 to about 1.2 million now. These children are more diverse than in the past with a higher percentage of Latino kids now 31 percent, up from 24 percent in 2000. The proportion of Anglo children has dropped 9 percentage points since 2000 to 57 percent of the states children in 2011. About 21 percent of children are living in immigrant families, slightly less than the national average of about 24 percent. The vast majority of Colorado kids in immigrant families 88 percent are U.S. citizens, and 97 percent have parents who have lived in the U.S. for at least five years. Poverty rates vary widely from county to county. The highest poverty rate for families with children is in Pueblo with 27 percent. Denver ranks second-highest at 26 percent while Douglas County has just 5 percent of families living in poverty. For the second year, the report includes a child well-being index that assesses health, education, and family and community support. Douglas County topped the list of Colorados counties for the highest outcomes while Denver ranked at the bottom of the 25 largest counties in the state. The other counties among the top 10 were Elbert, Broomfield, Boulder, Larimer, Jefferson, Routt, Teller, Eagle and La Plata Counties. There continue to be significant and growing gaps between children who are doing well and those who are struggling that are influenced by family income, as well as factors like race, gender, community and neighborhood, Watney said. Still, Colorado has a long way to go both on health and education matters if its going to live up to his goal of making Colorado the healthiest state in the nation. We are never going to do that if we dont address in a very focused way how healthy our kids are. While disparities among children are especially marked on education, Watney said the good news of the 2013 report centered on child health. Along with an increased number of children who have health insurance, more expectant mothers are getting prenatal care and Colorados teen birth rate is also declining. Policy changes are the key to improving how children fare in Colorado, Watney said. Ensuring our state has the kind of funding mechanism to support a world-class education system; ensuring that our most vulnerable families have access to health care and streamlining our early childhood programs so that parents and families have the best access to those services are among the Childrens Campaigns highest priorities as we look at the data about where we are and ensuring that we are headed in the right direction. As Colorado seeks to improve its outlook for children, Hickenlooper said its key to entice businesses so the economy will be healthy and parents will have better job opportunities. Businesses want to be in places with healthy schools and healthy children, Hickenlooper said. The great dividends are going to be in years to come, having healthy, well-educated kids who are going to lead the state. The governor also frequently cites his goal of making Colorado the healthiest state in the nation.